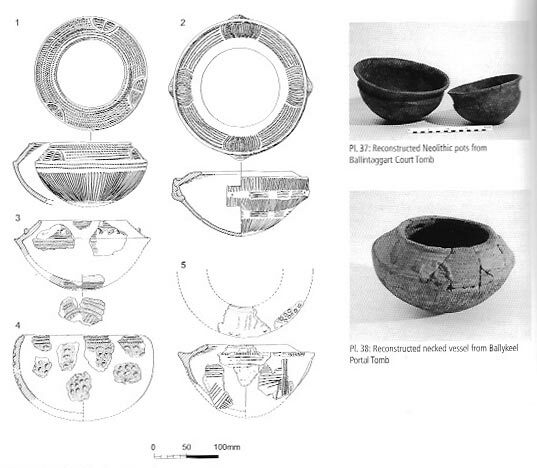 After going through the archaeological evidence from the Navan Fort complex I decided to expand my research to look at artefacts found in other regions in Ireland from the periods of occupation at Navan. This information will help to build a clearer picture of the peoples who would have worked, occupied and revered Navan Fort. The following images are from A History of Ireland in 100 objects which is a great resource for looking at artefacts from key periods in the history of Ireland. Evidence discovered while constructing the Navan Centre and during excavation of the mound (site B) at Navan Fort points to Neolithic occupation of the area. Finds included shards of Neolithic pottery, a stone axe, flint flakes, a plano-convex knife and flint axe. This Jadeite axehead was found in Kincraigy, Co. Donegal. The stone comes from Mont Beigua, Italy c. 4300 BC and was probably brought to Ireland by immigrant farmers from northern France. This rare axehead symbolised the power of humans over nature and it was a high status item which gave prestige to its owner. This pot was one of three vessels discovered in a small cave in Annagh, Co. Limerick. The pots were grave offerings found alongside three full human skeletons, two sets of partial remains, animal bones, a flint blade and arrowhead. These pots were probably used for drinking and demonstrate a form of domesticity. The animal bones were from domestic and wild species, showing that while hunting was still important for these people the farming of livestock was gradually becoming the norm. This intricately carved macehead was found in the great passage Tomb at Knowth in Co. Meath. All six surfaces of this piece of flint have been intricately carved with diamond shapes and swirling spirals and demonstrates the high levels of artistic and technical ability in Neolithic society. Shallow grooves discovered under the mound (site B) at Navan Fort indicate that the area was ploughed and cultivated prior to the construction of the wooden buildings. These gold discs were found in Tedavnet in Co. Monaghan and are decorated with crosses worked with rows of dots, lines and zig-zag patterns. Golden discs were associated with reverence of the sun and these items may have been wore by a king who wished to associate himself with its life-giving power. 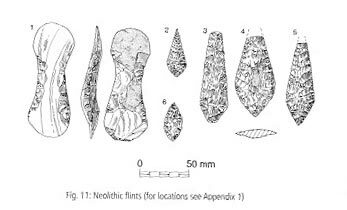 The remains of a Late Bronze Age ditched enclosure were uncovered under Site B at Navan Fort along with four small bronze objects chacteristic of this period: a socketed axe head, a tiny spear head a sickle blade and a mount from a scabbard. The figure of eight structures discovered under the mound (Site B) spanned the transistion from Late Bronze Age to Iron Age. These gold torcs were found close to the Rath of the Synods on the Hill of Tara in Co.Meath. They were made by hammering a gold bar into four thin flanges which were then twisted into a circle. These large torcs may have been worn by the kings of Tara. Whereas previous torcs were made from a small amount of gold hammered into a sheet that was shaped and decorated, these later torcs required a larger amount of gold and more sophisticated construction. The quality of these torcs denote the importance of Tara and its combined political, religious and spirital power. This beautiful gold collar was found in 1932 in the Burren, Co. Clare. It had been bent in two, probably to release its power, before it was buried. The gorget was made at the height of gold working in Europe and demonstrates the range of artistic and technical skills of craftsman at this period. These Irish collars are similar in structure and decoration to European bronze cuirasses (a highly decorated piece of armour that covers the torso) and represent the European warrior cult. This bronze caldron was found in a bog in Castlederg in Co. Tyrone. It was made from sheets of bronze shaped and held in place by rows of rivets. The skills required to craft this item and the repairs made to such cauldrons suggest they were highly prized and owned by the most important members of society such as a king. The cauldron was most likely used as part of a ceremony reflecting the use of bronze feasting equipment seen in Western and Central Europe at this time. The body of the Old-Croghan Man was discovered in a bog at Croghan Hill, Co. Offaly in 2003. The leather and tinned bronze armlet with stamped metal clips representing the sun denotes the wearer was a person of high status. The man endured a violent death: hazel rods were threaded through holes in his upper arms, he was stabbed in the chest, struck in the neck, decapitated and cut in half. This was a ritualistic ‘triple killing’, a sacrifice made to appease the three natures of the goddess of sovereignty, fertility and war/death. Old-Croghan man was young and healthy at the time of his death. He was found close to the inaugural site of the kings of Ui Failge and is thought to have been a king or aristocrat who was sacrificed by the people at a time when Ireland became colder and food more scarce. Further concentric slots provide evidence of multiple figure of eight wooden buildings at site B. The remains of a large wooden structure was discovered under the mound, at site B. The building was filled with a stone cairn and had been set alight. The burnt remains and the cairn were covered in turves and soil to form the present day mound. Excavations of the barrow at site A and a later excavation at Site C uncovered two sets of three concentric slots which form the foundations of a large wooden figure of eight structure. This 50 m long, Iron Age, structure is contemporary with the building of large wooden building at site B and can be dated to c. 100BC. This gold boat is part of a hoard uncovered at Broighter, Co. Derry on the shores of Lough Foyle. It is thought the hoard was left as a votive offering to a sea god. The boat is only 20cm long but it is highly detailed and thought to be a model of an actual ocean-going vessel. The full-size boats would have been made of wood or hide and used to trade with Britain and Europe.